The marketing team at Procter & Gamble is at it again with their amazing tribute to Olympic Moms, Thank you, Mom by P&G. We dare you not to tear up! #BecauseOfMom. 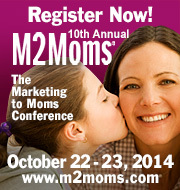 P&G’s presentation on this campaign for the Summer 2012 Olympics was one of the highest rated at M2Moms 2012. We can’t wait to see the rest of the ads!